With the weather warming up, its is only natural to find yourself swapping a cake for some frozen yoghurt and coffee for a frappe. Taking inspiration from the warmer months ahead, we have put together a collection of ideas for creating a variety of interior styles for a modern dessert café. Taken from cities around the world, we highlight the options and possibilities to recreate a similar ambience with furniture pieces from the Spaceist range. La Piandina Cambados brings together a playful twist on ice cream with a classical Italian recipe combining beer and ice cream. A pure white palette infused with accents of bold and bright neon colours, the simplicity of the interior style gives this dessert venue a modern and stylish appeal. The interior is divided into two spaces; one offers ice creams and is intended for shorter footfall, whilst another more cosier atmosphere has been created for coffee and drinks intended for longer staying visitors. Both spaces complement the chic interior with a blend of black and white with a permeable and artificial ‘wall’ dividing both spaces. 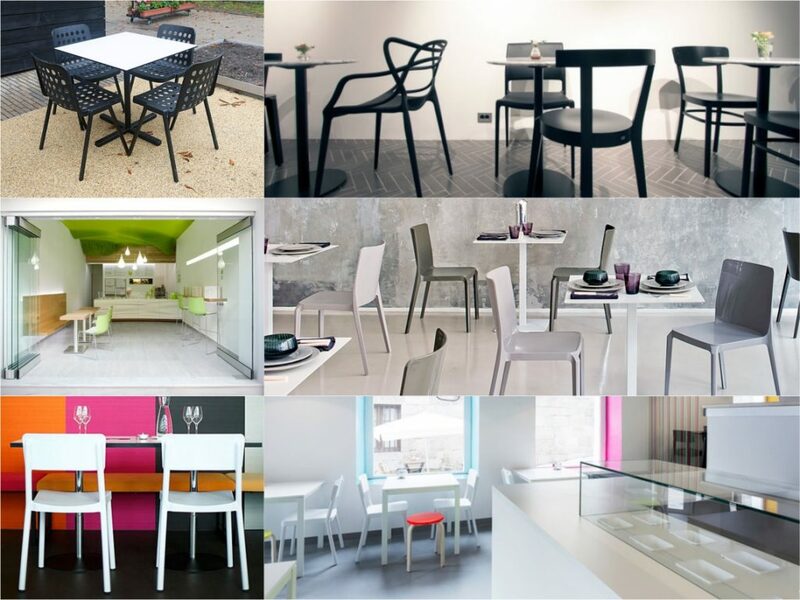 A versatile seating option, the Lisboa café chair comes in a solid polypropylene material. 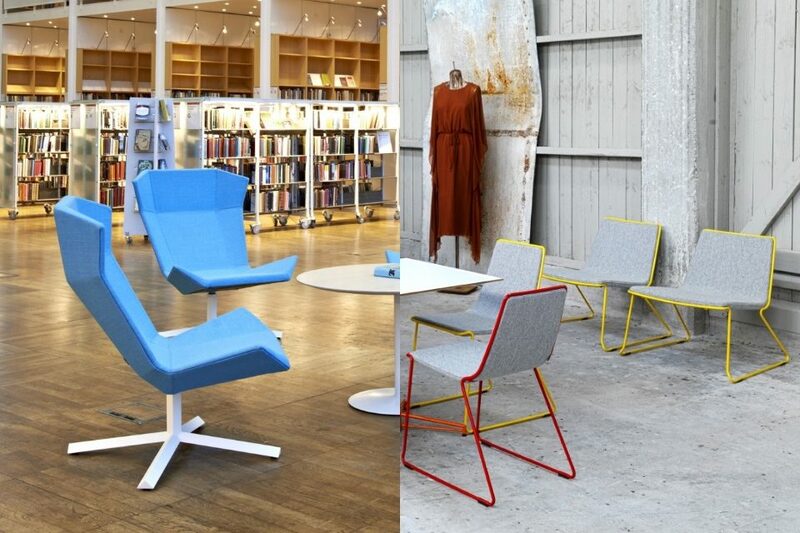 Enhance a duel purpose space with the Lisboa chair by selecting it in different colours for the different spaces. 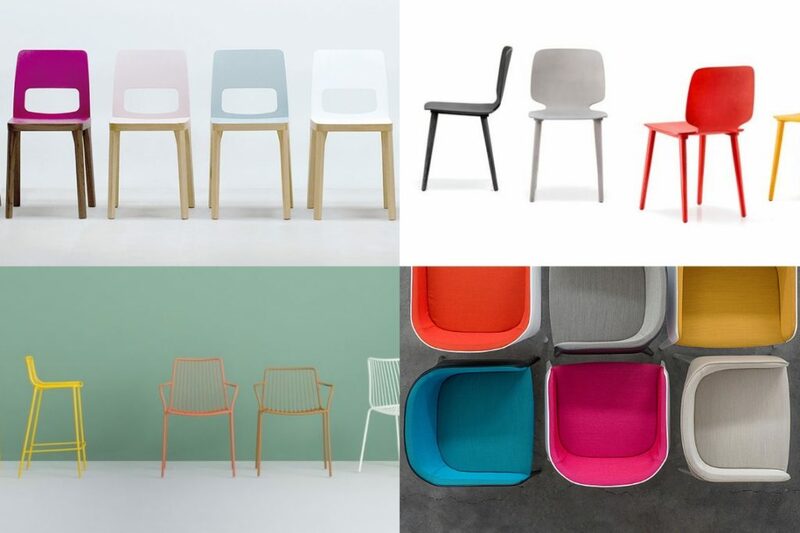 As well as classic black and white, the chair comes in red, olive green, chocolate and sand. The classical form of the chair along with its updated properties makes it suitable for stacking and the UV protection coating also makes the chair ideal for outdoor use. 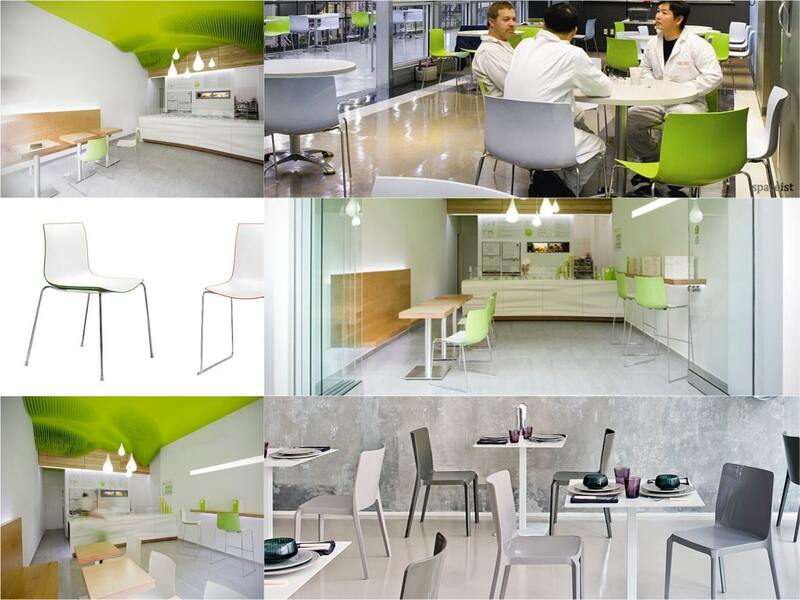 To accompany the Lisboa chair, we have selected the Togo café table. The simple yet stylish appearance of the sleek laminate top and aluminium base legs makes it a study and hard wearing option for contract use. Along with over five sizes to choose from, the laminate top comes in black or white with three base leg finishes. 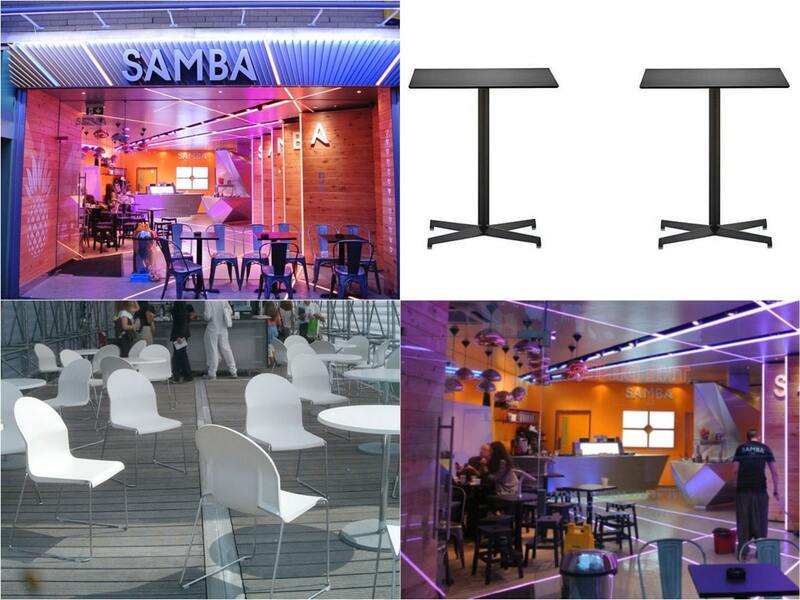 As a smaller and slightly intimate option, we present the Bold café table. With its solid X shape base and solid laminate top, choose from a range of colour options to complement the interior space of a project. A frozen yoghurt store based in Camden, Samba Swirl presents a low-fat version of a highly popular dessert. The vibrant theme recreates a South American carnival spirit through the combination of lighting fixtures installed throughout the shop. The theme continues into the outdoor space with LED lighting on the floor. With seating offered inside and outdoors, the items have been selected to meet these requirements. Creating a furniture package that suits application for both indoor and outdoor use with compromising on style can be a challenge. However, the Laj square tables presents a suitable solution. Made from a solid laminate top and steel base legs, the table can be used indoors or outdoors. Modest and ideal for economical budgets, the Laj square table comes in a white, black or wood finish top. Presenting durable resistance to the outdoors and also against scratching, the Aida café chair presents a simple yet stylish and comfortable seating option to complement the Laj table. 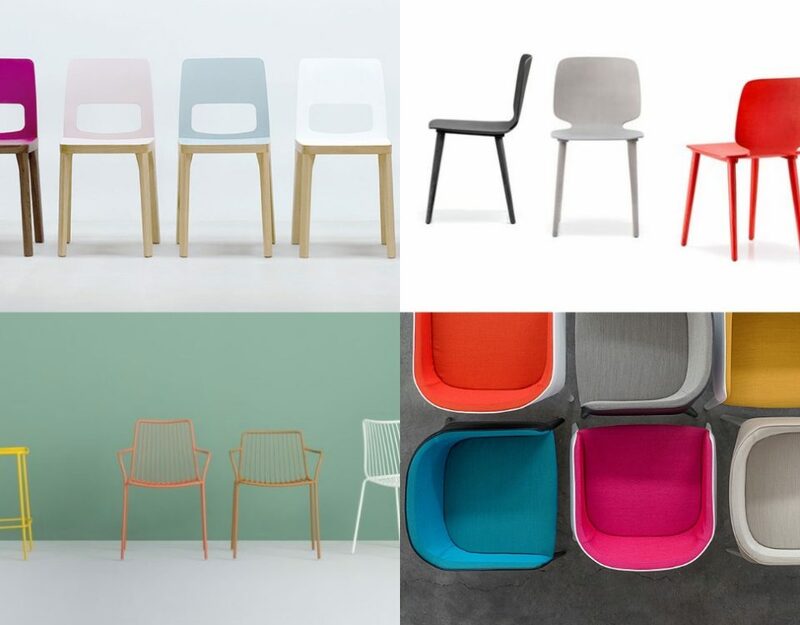 With sturdy stainless steel base legs, the polypropylene seat comes in seven different shades making it possible to match the seat to a range of colour palettes. The interior of Froyo Yogurteria, a frozen yoghurt shop presents a mixture of architectural forms adding a modern twist on the simple interior. The brightly coloured ceiling eventually transforms into a three-dimensional structure that covers the space above the serving counter. The uniform green used throughout adds to the branding style of the shop. 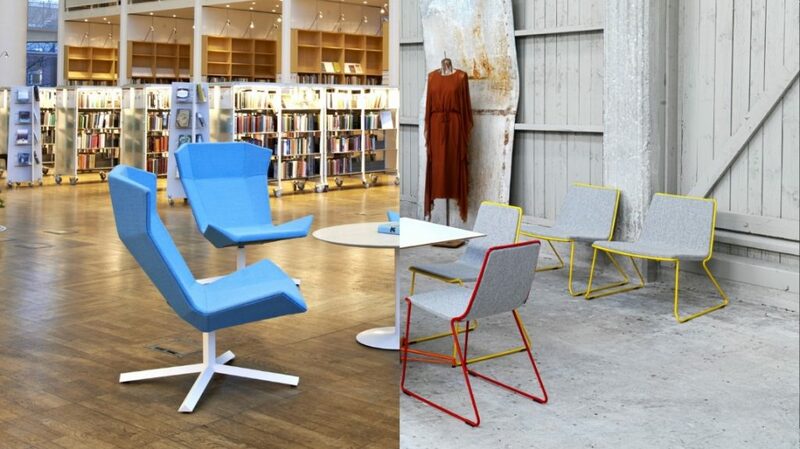 The brand colour is introduced with in the shop by a use of accents on both furniture and accessories. Our wide selection of furniture items come in a selection of colours making it possible to brand match colours of material, styles of laminate and sizes for each project. 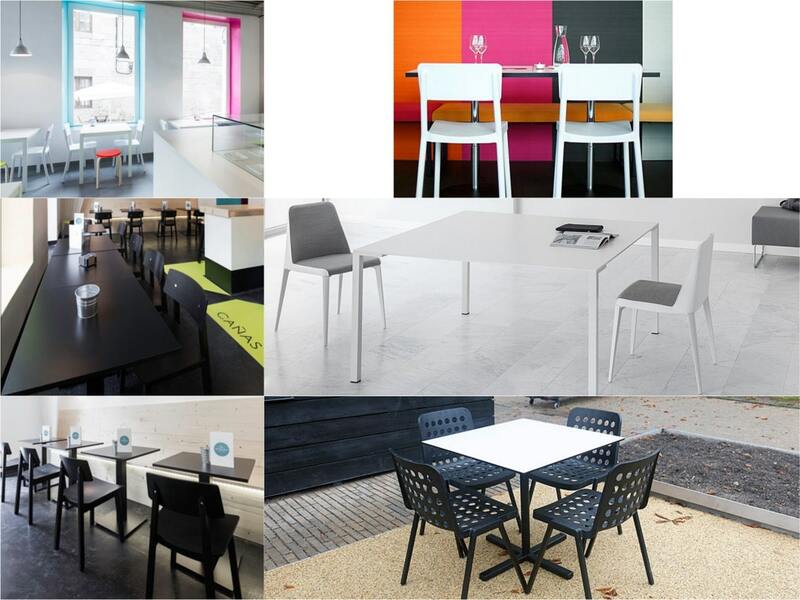 The Inox square table forms part of a versatile range of tables that presents a selection of sizes, from square to round. The table top, selected here in a white laminate, also comes in black or three wood finishes. The square base also comes in a choice of finishes including white, black, brushed or polished steel. 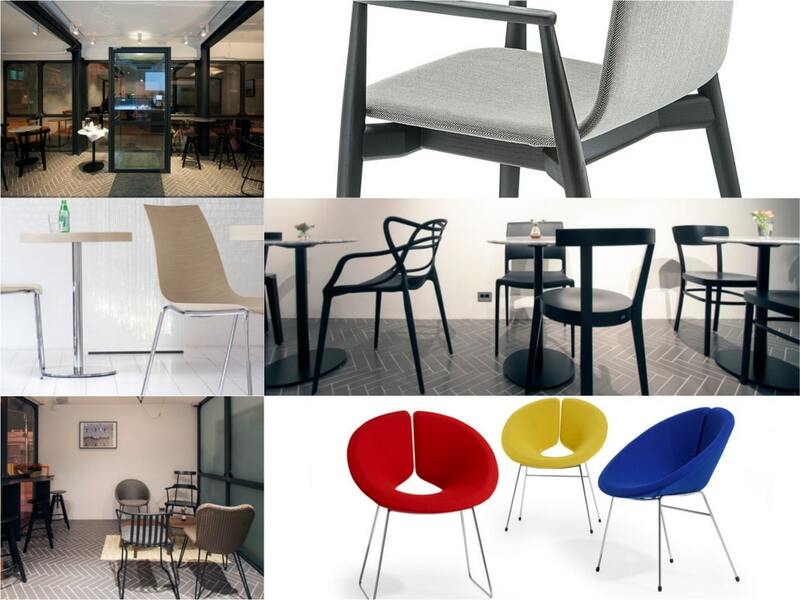 To complement the Inox table, the Catifa 46 café chair offers variable options. Constructed from a solid polypropylene seat and metal base legs, the chair is stackable for convenience. Choose from a wide range of colours to customise the seat according to brand matching where necessary. With combinations including front and back seat colours, it is possible to create a bold look for contemporary café interiors. Taking inspiration from European interiors, this sophisticated dessert shop presents a mature attitude towards a specialist bakery idea. With selections of grey tones, creams and browns, the interior is modish and laid back. Through a combination of furnishings, each space has been addressed to meet a variety of needs. From classical café seating to more relaxed coffee tables and soft furnished chairs to the private booths, Dessert Cafe Pied recreates the personal homely touches with a creative flair. Combining serious types of furnishings within a space allows a simple way to create a different ambience according to the use of the space. Add classical café seating with the Malmo wood chair. Along with a selection of seat finishes including fabric colours, the solid wood comes in a selection of stunning finishes. The armrest version adds comfort whilst the chair provides a modern twist on a classical wooden chair. To accompany the Malmo chair, we present the Inox round café table. The Inox table range offers a stylish option for modish interiors and comes in eight sizes. The disc base comes in either black or polished or brushed steel. Create relaxed seating with the Little Apollo chairs. The chair is a representation of classical design recreated with a modern metal sled or 4 leg base option. Constructed from curved wood, the seat enhances the posture for comfort. 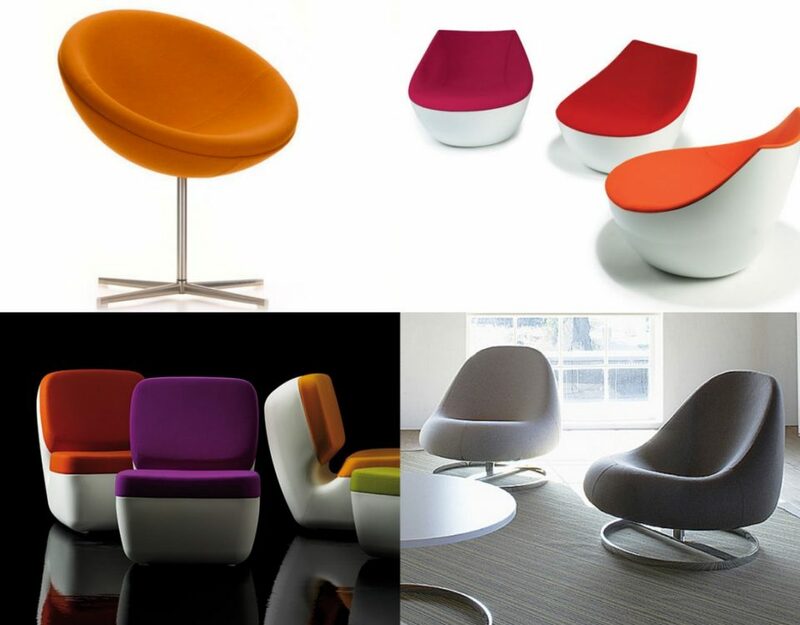 Available with a wool or leather upholstery, choose from a wide range of colours to create a brand match.